The Décor 5 Blooms Printed Canvas 2 Piece Set introduces an elegant touch to your space. 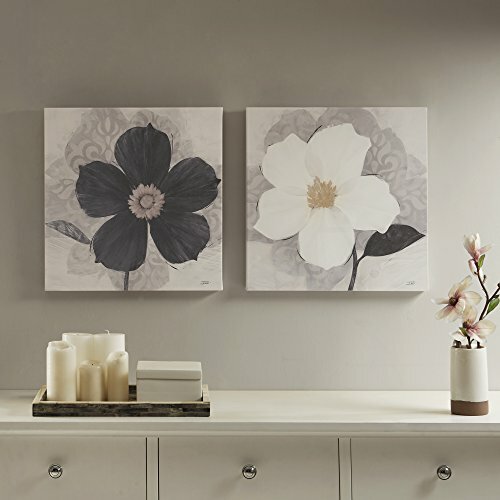 This two piece canvas set features printed flowers in black and white hues that create an elegantly casual contrast, and this mild color combination goes well with any room color and theme. The pine wood stretcher bar pulls the canvas tight in a gallery wrapped style, while also providing structure and support. Mount this printed canvas wall art set together or separately to complement the bold beauty of your living room or bedroom décor. Please remove the paper corners and protective paper over the sawtooth before using. The sawtooth is already fixed to the back of the frame bar and ready to hang. Just hammer a nail (hammer and nail not included) onto your wall where you want the art work to be, and hang! While we try our best to present the most accurate color, the actual color of the product may be slightly different from what it appears from your computer/phone screen. This is unavoidable and is caused by different monitor/screen brands and color settings, the color of light under which you are viewing the product, and also the wall color of your room. SIZE - 2 panels, 18 (L) x 18(W) x 1.25(H) inches each. ARTWORK - Printed painting of black and white flowers on a beige background. Image is printed with high resolution Giclée technology on gallery quality canvas to ensure sharp and vivid image on every piece. This set of beautiful, unique art will refine your space with modern elegancy. FRAME MOUNTING - The canvas is wrapped around and staple mounted on a pine wood inner stretcher frame/bar that pulls the canvas tight in a gallery style, while providing a durable structure and support. The hanger hook/sawtooth are included and installed on each artwork and ready to hang. DÉCOR - A great choice for decorating your living room, bedroom, kitchen, dining room, restroom, office, hotel rooms, lobby and halls. This canvas set is an ideal gift for Christmas, New Year, birthdays, anniversaries, and just about any occasion year round for your friends and family. SATISFACTION - We offer 100% satisfaction guarantee with 30-day free return. If you have any questions about this product by Décor 5, contact us by completing and submitting the form below. If you are looking for a specif part number, please include it with your message.